On February 3, 2013, an unprecedented event occurred at Mercedes-Benz Superdome in New Orleans: the Blackout Bowl. The cause of the outage was eventually traced to a faulty electrical relay device, manufactured by a vendor supplying Entergy New Orleans, the company that provides power to the stadium. Ironically, the relay device was installed in switchgear designed to protect the Superdome from a cable failure between power lines. Fortunately, Federal Pacific’s Network Protector Switchgear helps ensure that a similar malfunction doesn’t occur. Whether it’s a high-pressure, high-attention event or day-to-day business, this switchgear has proven to be a valuable commodity for numerous customers of major electric power companies who require medium-voltage protection and reliable network stability. Network systems are an alternative to traditional power distribution methods, providing two or more parallel feeders to supply networked customers, which allows uninterrupted power during many power system problems. 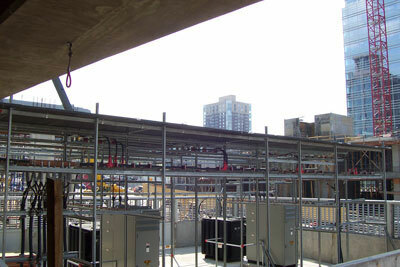 They deliver the highest level of reliability for power distribution systems and are most desirable for critical loads. As a result, an outage on a primary feeder does not cause a customer outage. In addition, less transformer capacity is required, there are lower peak loads on transformers, transformer losses are typically less, and the system provides improved voltage regulation. Federal Pacific’s Network Protector Switchgear helps power companies provide seamless service for their customers with higher voltage needs, such as metro areas, skyscrapers, airports, hospitals, stadiums and other very large facilities, ensuring that the lights stay on ― no matter what. The switchgear unit is used in 4160-volt applications, enabling power companies to parallel several transformers through the network protector, and safeguarding the entire system by automatically separating out a transformer that experiences any issues — keeping the system running smoothly and the power from going out.